Welcome to the Frugal Tuesday Tip, a linky blog hop, dedicated to encouraging the frugal lifestyle. This week, I’m attending a special education conference. It’s a three day conference, and the first 1000 public (I think that means not professional) registrants got in free, so my tip this week is “Be an early bird!” Related to that is the next frugal tip: “Watch the webcast!” If you cannot take the travel time and expense, look for webcasts or webinars. My special education conference held a live feed at EduVision. For special needs ministries at church, I could use Key Ministry for online conferences. They’re free! You can explore other topics through the web, too, with the same travel savings — blogging, nutrition (I’ve watched webinars with Kitchen Stewardship and GNOWFGLINS), as well as Twitter parties. You can read my full tip over at Examiner.com. 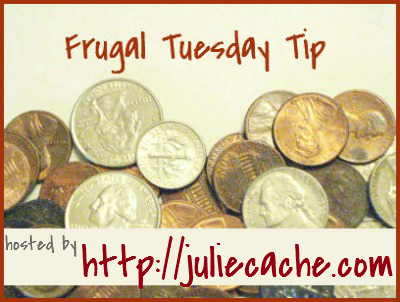 Let’s get started on this week’s Frugal Tuesday Tip! This is just SOOO wonderful idea to look for webcasts & webinars, I have few friends who are always busy with some or the other seminars, they always share some wonderful experiences.. I am sure being an early bird has its merits.. Watch out the first 1000s, I am also going be one of you now :)!